The adventures of the mysterious crimefighter known as The Avenger were originally published in The Avenger magazine from September 1939 until September 1942. The Avenger also appeared in a series short stories in Clues Detective magazine from September 1942 until May 1943 and also appeared once in The Shadow magazine in August 1944. From June 1974 until May 1975 The Avenger appeared in a new set of adventures published by the Warner Paperback Library who also reprinted the adventures from the original Avenger Magazine. The Avenger appeared in a couple of short-lived comic book series by DC Comics in the 1970's and 1980's. 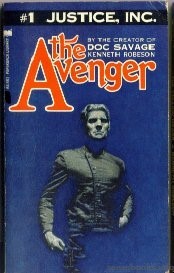 the definitive book on the Avenger. # 1-26: Jim Brandon, a famous biochemist is Avenger, using thetelepathic indicator and diffusion capsule. # 2 "Mystery of the Giant Brain"
# 3 "Rendezvous with Murder"
# 4 "Eyes of Shiva"
# 5 "Coins of Death"
# 6 "Mystery of Dead Man's Rock"
# 7 "Tunnel of Disaster"
# 8 "Crypt of Thoth"
# 9 "Melody of Murder"
# 15 "Department of Death"
# 16 "Keys to the City"
# 17 "Death in Mid-Air"
# 19 "Death Rings the Bell"
# 21 "Cradle of Doom"
# 22 "Death Meets the Boat"
# 23 "Murder Hits the Jackpot"
# 24 "Diploma of Death"
# 25 "Shot in the Dark"
# 26 "Death Counts Ten"
August 29, 1941 "Blood Ring"
September 2, 1941 "Devil's Horns"